Well, it has happened for the first time - a driver from Poland has managed to secure prime spot on the grid for a GP (no obvious jokes about "pole" from me - I'm waiting until they have an Antarctica GP for that). Congratulations to Robert Kubica and the BMW Sauber team! They remain on course to be one of the big three this year. In fact, this showing is probably ahead of the expected schedule, just as BMW seem to have stayed one step in front of their stated aim for the last two years. This is what happens when you have a calm, realistic and methodical boss in charge of the press releases, I guess. Good for Dr Theissen, I say; it was great to see his enthusiastic response when it became impossible for anyone to bump Robert from his position at the sharp end of the grid. It is unlikely that Kubica will win the race, however. The fact that Heidfeld's sixth spot forms the other slice of bread in a McLaren/Ferrari sandwich gives a better idea of BMW's true pace than Robert's undoubtedly low-fueled pole time. An early stop traditionally means a dropped position or two, Heidfeld's grit and reliability usually yield a couple of places, so we can expect the Beemers to be fighting for a podium spot rather than the win. As a BMW supporter, I am allowing myself one more paragraph of crowing. The significance of Kubica's achievement is that BMW has demonstrated its ability to stay with the pace of development of the big boys away from home. In three weeks time, the European races begin and then you will see what BMW can really do. By mid-season they will have the quickest car in the field - or that's my prediction, anyway. Quick Nick for Champ! Turning to the other teams, I suspect that Ferrari are particularly annoyed that Massa did not manage to grab pole position. They know that Felipe's best chance for the win depends on him leading the first lap and now he will have to fight for it. This is a circuit where he shines, however, and you cannot rule him out, even though he is clearly on a lighter fuel load than Kimi, as usual. 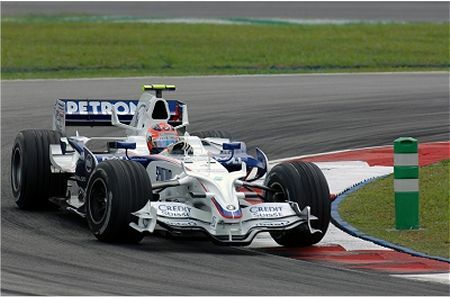 If Massa cannot steal the lead from Kubica at the first corner, his race strategy is compromised. Stuck behind Robert, he will be unable to build the huge lead expected and it is almost inevitable that his team mate will sail past at Massa's first pit stop. And that is ignoring the two McLarens and Heidfeld as well. The likelihood is that the McLarens, Heidfeld and Raikkonen are on very similar fuel loads. If that is true, the eventual finishing order will depend very much on position after the first corner. I can see Kimi being able to make up a place or two in the laps following but not the others - they will probably circulate together until the stops and, even then, the order will probably stay the same. Behind this group, Trulli and Rosberg will be close enough to seize on any mistakes but the rest are well back - a second separates Rosberg from the next up, Button and Alonso. Both deserve applause for hauling their uncompetitive cars into the top ten but they do not really have the pace to stay with the leaders. The lower midfield and the tail are made up of the usual culprits, although the Red Bulls disappointed for a change and Piquet and Nakajima faded after good practice performances. So who is going to win? The smart money has to be on Raikkonen; he has the fastest car and will probably be the last to pit after the first stint. Hamilton always has a chance, however, and he is lucky too. I would love to predict a win for Heidfeld but it is not going to happen. Yet. Massa, Kovalainen or Kubica? Not this time, I think. A fair and reasoned analysis, Clive. But Nick, Lewis or Hekki could indeed come through here based upon their heavier fuel load and what happens in the first couple of corners (and no screw-ups in the pits. That said, it's probably Kimi's race with Massa with an outside chance. I agree with your analysis Clive. a big crash in turn two, we'll blame it on Massa of course, Trulli finds his way through and continues for the win. Hey! It's not impossible, just unlikely. But then consider Clive's assessment, which is much more likely. Isn't it sad when we can PREDICT the outcome so precisely, so precisely we don't disagree !!!!!! Another F1 parade. It becomes less predictable as more teams become capable of winning, Number 38. Hopefully, we have seen the end of the one or two teams only years and things will get really interesting from now on. BMW have joined the elite and Williams and Toyota are nearly there too. This could be the best season we've seen in a long time. I cheered like hell for Robert. About the race: yes, I agree Clive, Lewis is a very lucky guy and he is a “demon” in the starts too (he moved over 5 cars in sepang!) and he will be in the clean side of the track tomorrow, so he can do it again! Writing after the race, it looks like I got it wrong and it's still Hamilton's turn to have the bad luck. It's a pity the BMWs made poor starts - if Kubica had led the first lap, we'd have had a good race on our hands. An interesting one, even so. Three CHEERS! for Massa; he's a flier when in front, whenever Kimi turned a fast lap Massa matched it. And I got my wish (refer my posting above) Trulli "won" the 'best of the rest'. Don't discredit Kubica, the BMW isn't yet a match for the Ferrari but the boy is doing VERY well with what he's got. Three teams fighting for the front and three teams doing a second show further back; we've got a good season ahead. The best in a long time. Clive, you must be really happy to see BMW take the leadership of the Constructor's Championship. Shows how consistent they've been in the first three races. I'll second what Ali said. In, right after we did the WCC maths during the f1fanatic live blog and saw the standings, you were the first person we all had on our minds! Hahaha! Absolutely, Number 38 - Massa can do it on occasion. And Trulli is fast, we've never doubted that. About time Toyota gave him a car that can compete. I am happy indeed, Ali. Notice, too, that Nick is second in the WDC - purely from consistency. We'll see if I'm still right at the end of the season, Journeyer. Obviously, I hope so! Now it's time for me to present my VALUE of CONSISTANCY lecture, a counter offer to those like Bernie who think WINS are the only measure of a Champion. And look where we stand today, three races, three different winners and a NON-winner leads the constructors standings! GREAT!, I say. Three races in and this is already the best season we've had in a long time. Three races in and we've had three drivers winning. Yet Nick is second in the championship because he gets the car as high as it will go and then finishes the race! He has earned that position by racecraft, hard work, speed and by avoiding the over-exuberant antics that others have indulged in; for my money, he's already proved that he is a better driver than any of them (including Kimi). Bernie should stick to what he does best: screwing the last cent out of anyone and anything connected with the sport. Wow Clive, your last line is fightin' words, "we don't wanna bee givin' him no idears ". Did you see the photo of Lord March and his daughter in the food court at Bahrain, a scowl on his face, "Did I just pay $100 for a sandwich and Coca-Cola?" Did you see the photos of the peon bleachers.........not a smile on ANYONE! The best seat in the house is my LazyBoy recliner 12 feet from the tele with the computer alongside tuned to Formula1.com "Live Timing", and a row of chilled Bulmer's at the ready! Do what you please Bernie !!!!!!! Fewer hands up for Nick? (Didn't you see mine Clive?) I was happy that Kubica won his first Pole, and some drama between Alonso and Lewis, but I thought the later part was a simple parade. A scene like Nick's overtaking in Malaysia would've brightened my early morning (with less sleep the night before). Ah, this one slipped down from the later post, I think. But I said "fewer", Arun - meaning that there are indeed a few of us around. But read the comments to Keith's latest on F1 Fanatic and I think you'll see quite a few doubters there. Comparing Heidfeld to Massa and Barrichello indeed - there'll be a few I remind of this come the end of the year. Massa and Barrichello? Are they even comparable to each other, let alone to Heidfeld?! ?